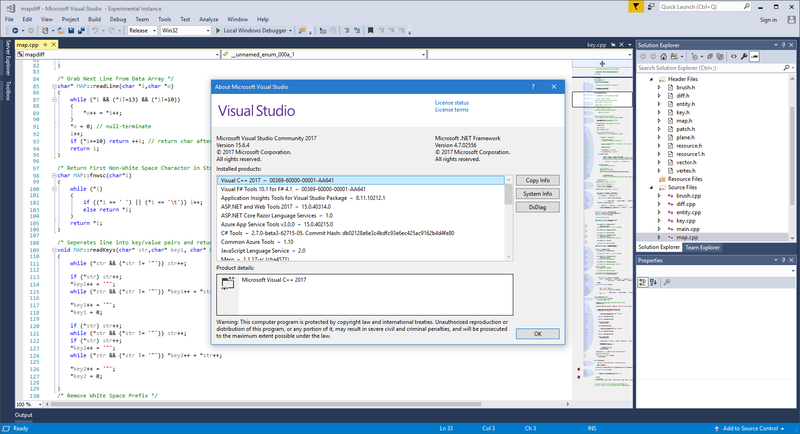 In Visual Studio 2017, some parts of the Structure Visualizer from the Productivity Power Tools were added to Visual Studio. Others were not included in the port. #4 is the one I missed immediately. The rest probably is ranked #1, #2 and #3 to me. Why I should have to spend my Sunday doing this is beyond me; but you're fucĸing welcome. May I offer my sincerest fucĸ you to Microsoft for not bothering to do this. We've waited for about 400 days for this to never happen. For the past 400 days, I've been editing code in 2015 and compiling it in 2017. And on a personal note to Mark WIlson-Thomas, for making us think Microsoft might have possibly considered re adding this, go sucĸ a dicĸ. #4 is most important to me. Our teams just recently switched from VS2015 to 2017 (Enterprise), and this is the most prominent missing feature. @Mark any update on this? Its been over a year. We have just updated to VS2017, and its disappointing to see PPT features deprecated in favour of a builtin implementation that has only 10% of the functionality. I just upgrades to VS2017 and was shocked that #4 is no missing from Productivity Power Tools. Getting strucutre Information in the map mode was essential to me when navigating source code. Microsoft, you are a fucĸing disgrace. #4 is essential for me! It helps tremendously to navigate in large source files. Please prioritize items #3, #1, #2, #4 for the Structure Visualizer in VS2017. I have grown accustomed to the colorized and solid structure guide lines that were once available in the Productivity Power Tools extensions pack. As you have no problem not implementing this (We've been waiting all year). Why not open source the 2015 PPT extension, and let us do it for you? @Stephen: thanks for your comments. I wanted to let you know that although we don't have #1,#2 yet, you can customize the (default grey dotted) lines to a different color to help them stand out more, in Tools-Options-Fonts & Colors-Text Editor (Display Item is "Structure Guide Lines"). Pick an item background of your choice and press OK. Hope that helps a little. @Peter, thanks for the input on increasing the number of supported languages - this is being actively considered. Please prioritize #1 and #2. #3 and #4 would be nice-to-have, but don't "break" what was in 2015. I use a 2 space tabbing, and found that the dashed lines are very hard to distinguish and follow, which is what brought me here. and please for ALL supported language types in VS !! !